he gets out when I’m 2, but goes back because later I remember my mom saying I have a surprise for you and I think it’s a record player, but it’s my dad behind the door, home from jail. so he went somewhere between 2 and 7, somewhere with dinosaurs and a bumpy gravel road. 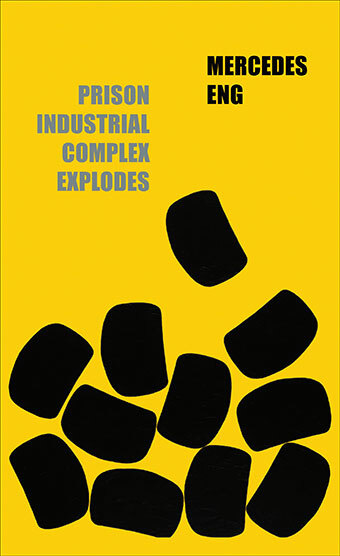 Vancouver poet Mercedes Eng’s second collection is Prison Industrial Complex Explodes (Vancouver BC: Talonbooks, 2017), an incredibly powerful and intimate exploration of the Canadian prison system and systematic racism through archival material and her own biography, specifically that of an absent and imprisoned father. There is something akin to George Bowering’s George, Vancouver (Weed/Flower Press, 1970) to the way Eng goes back and forth between the personal and the archive, and a line between the two that often ceases to exist, working through a portrait of her father, his incarceration, and the effects it couldn’t help but have upon her childhood. This is a difficult and complex work, one that exists as much as a non-fiction critique on the inherent racism throughout the prison system as it does an intimate long poem utilizing her father’s words against, one might say, the words of the state. Given how deeply Eng composes her long poem as critical essay, it does feel very much that she has opened the boundaries of what had been done previously with a form that Dorothy Livesay termed the “documentary poem”; Eng isn’t simply reshaping the archive into the space of her poem, but discovering, instead, a space where the form of the long poem and the critical essay, in part through her use of found and archived materials, meet. Furthering the work of what has come before her, this is the long poem realized in an entirely new way, all while articulating some very difficult terrain. And the question becomes: now that we’ve Mercedes Eng’s Prison Industrial Complex Explodes, how are we to respond? Where do we go from here? After the emergence of such a poetry of witness, might it perhaps spark an action? According to RCMP documents obtained through access-to-information requests, the federal government created a wide-ranging surveillance network in early 2007 to monitor protests by First Nations people, including those that would garner national attention or target “critical infrastructure” like highways, railways, and pipelines. A series of “weekly situational awareness reports” from Aboriginal Affairs and Northern Development Canada reveals a rigorous cataloguing of Idle No More’s activities. In addition to the Aboriginal Affairs reports, Canada’s Integrated Terrorism Assessment Centre, which operates within the Canadian Security Intelligence Service (CSIS), prepared a threat assessment on Idle No More.